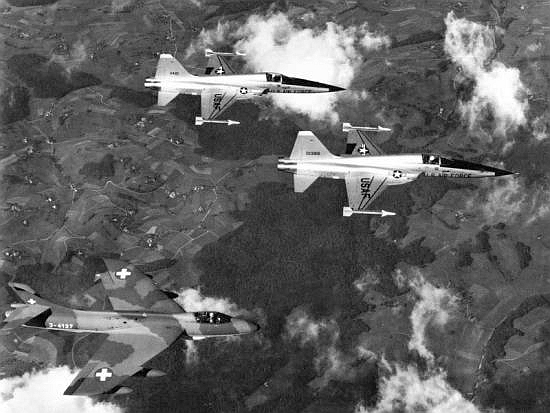 The first evaluation of the Northrop F-5 was in 1967, version F-5A, competeing against the LTV A-7 Corsair and the Douglas A-4M as a fighter-bomber but any decision was postponed to a later (unknown) time. The year 1972 saw a new selection round to replace the remaining Hawker Hunter; Saab J-37, BAe Harrier, GAMD Mirage F.1 and the Northrop F-5E Tiger participated to it. Air support capabilities were abandoned in favour of a local air superiority at low and medium altitudes (up to 6'000m), interception/ground attack being secondary functions. The Tiger was from the very beginning the preferred aircraft, particularily in view of its militia suitability. Evaluation during 1973 involved an in-depth scrutinity of the Tiger; two Swiss test pilots went in the autumn to the USA for a pre-evaluation, following which Swiss in-country tests were requested. These started with the arrival of two aircrafts (serials 71-01421/72-01386) at Emmen AB on August 12th, comleted by September 23rd 1974. Actual testing lasted two weeks; it included 62 flights fomm Emmen AB and from mountain bases. 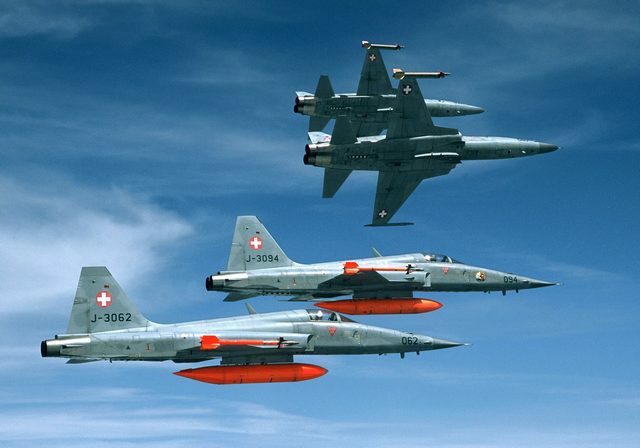 Five Swiss pilots had been trained bewtween mid-June and mid-July at Williams AFB for a total of 18.55 hours on Northrop F-5B and 25.21 hours on the Tiger; four other pilots (including a militia one) were checked out in Switzerland on the single-seaters. Mock air-combats were engaged against an Hawker Hunter Mk.58 and an Mirage IIIS; cannon firings against a target towed by an Hawker Hunter as well as against the wreck of a grounde de Havilland Venom. No decision had been taken at this time wether to re-equip 4 or 5 Squadrons, needing 60 or 80 aircrafts (some of them two-seaters) and if to build or assemble the aircraft under licence in Switzerland. Finally, a decision was made to buy 66 Northrop F-5E, 13 built by Northrop, the remainder to be assembled by the local Federal Aircraft Factory (Eidgenössischen Flugzeugwerk) at Emmen, plus 6 double-seaters F-5F built by Northrop. These were to re-equip four Hawker Hunter Mk.58 equipped Squadrons of 12 aircrafts plus 3 reserves each. Requested modifications to the basic aircraft included a Rear Warning Radar, instllation of a Swiss IFF system, antiskidding brakes, a fatigue meter, an improved General Electric APQ-159 radar and, for operation from bases' montaneous caverns used as hangars, a gaseous oxygen system as well as strenthening of wing hardpoints to attach the aircraft to the cavern's roof. Authorisation for a credit of 1'170 millions Swiss Francs (ca USD 400m at the time) was given by the Swiss parliament on 16-03-76; Foreign Military Sales contract with the US Government (named "Peace Alps") was signed on 30-03-76, the USAF being responsiblefor the execution. A further contact between the Swiss Federal Factory and Northrop granted the licence for local assembly; all General Electric J-85-A-21 engines were purchased directly in USA and airfreighted ex Boson via the national carrier Swissair. Offset production for Swiss products (not necessarily military) was established with a target set to at least USD 135m (ca 30% of the costs); by November 1981 it had reached USD 209m (55%). Events followed very fast after the signature of the contract. A team of 13 ground technicians went to the USA for 5 weeks; two pilots, including the Armament Service - Flight Test Center (Gruppe für Rüstungsdienste - Flugversuche/GRD) chief pilot, went for five weeks in mi 1978 to Edwards AFB for tests and evaluation flights. There were initially problems with the braking system, insufficent on wet runways, and with the unsatisfactory radar during night flights. Sub-assemblies for the first two aircrafts to be locally assembled arrived at Emmen on 30-11-77 on board of a Trans International Lockheed L-100. First Palmdale completed aircraft was the second frame (serial J-3002), rolled out at Palmdale on 19-10-77, while the first Swiss frame (serial J-3001) was first flown on 09-12-77. This aircraft undertook all Swiss specific tests and remained at the USAF Flight Test Center, Edwards AFB, till at least July 1979 to complete the test programm. First flight of a Swiss two-seater (serial J-3201) followed on 07-03-78. Consideration was given to airfreight the Northrop-built aircrafts to Switzerland but delivery on board USAF Lockheed C-5A Galaxy was less expensive; Tigers were accepted by the USAF at Palmdale's Northrop plant, tested, flown to McClellan AFB where they were disassembled and prepared for delivery. The first Tigers arrived at Emmen AB on 22-08-78, five single- and one double-seaters. Additional deliveries followed on 21-09-78 (6 aircrafts) and on 18-10-78 (7 aircrafts), completing the first part of the contract. First Northrop F-5E at Emmen AB with tiger painted on nose; of note early AIM-9B Sidewinder on wingtip. This weapon was actually never used on the Tiger. Arrival of the first batch on 22-08-78 coincided with the official roll-out of the first locally assembled aircraft (serial J-3014), whose first flight took place on 29-08-78; local assembly had started in January 1978, needing approximately eight months for each frame to be completed; the aircrafts reached the Air Force after having been handed-over to the BAMF which checked its status/operability and, if to its entire satisfaction, accepted and readied for operation.The complete spare-parts stock, consisting of 150 tons of aircraft and ground equipment was delivered by October 1979. Radar and navigation simulators were also bought. Air-to-air missiles were used, initially in the form of AIM-9B Sidewinders, followed by AIM-9E3 Sidewinders; financing to upgrade these last to AIM-9P3 for sFr 75m was granted on 18-09-78; newer the AIM-9P-4 missiles were received beginning 1988 and later modified to the P-5 versions. A Tiger Instruction Group, formed by professional pilots, was established on 01-08-77 to ease the introduction of the fighter and to develop new tactics as as well to translate technical documentation in German. Basic training of four professional instructors and one Federal Office for Military Airports (Bundesamt für Militärflugplätze/BAMF) pilot started on 05-08-78 at Williams AFB with the 425th Squadron; of these, the Swiss Air Force head instructor and one instructor pilot attended the Fighter Weapons Instructor course in November/December 1978. Air combat instructors were to follow years later. First Northrop F-5E was handed over to the Air Force on 10-10-78, one month ahead of schedule; by the end of 1978 eight had been accepted (4 more than scheduled) which had flown a total of 29 hours. Official first public appearance was in Zürich on 17-03-79, flying mock-attacks on targets on the lake by 7 single- and 3 double-seaters. Northrop F-5E J-3003/04/07 flying towards Zürich on 17-03-79. All six two-seaters, plus 16 single-seaters had been delivered on 11-04-79; 1'000 flying hours had been flown by mid 1979, more than 2'000 hours by the end of the year. 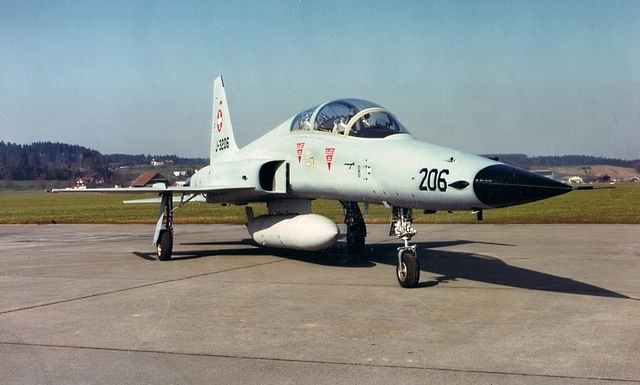 The three main peace-time bases (Payerne, Dübendorf, Meiringen) plus Interlaken maintenance base were adapted to the Northrop F-5 and conversion training of the first two professional Squadrons started during 1979. 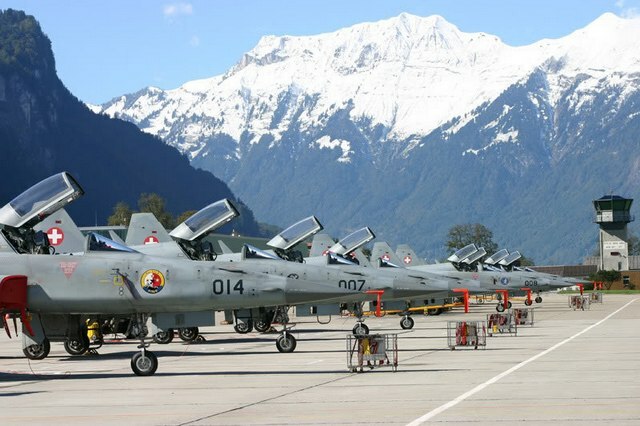 Official hand-over to the two combat ready units, Squadron 11 and 18, took place at Meiringen AB on 30-10-79, 25 single- and 6 double-seaters had been handed over to the Air Force by this day. By 31-10-80 there were respectively 51 and 6 in use; seventy-two pilots belonging to all four foreseen Squadrons had completed their technical conversion and air combat training for a total of each 60 exercises in approximately 6'000 flying hours; twenty 100 hours checks had been undertaken on airframes. The last aircraft was accepted by the Air Force on 09-04-81, when a total of approximately 10'000 hours had been flown by the fleet. Complete maintenance and equipment independence had already been reached by March 1981. Two Tiger equipped units were manned by pilots of the Surveillance Wing by 1981, one additional was in conversion in 1983; all three reached combat-ready status during March 1985.
fication and VHF radio antenna. three known to have been decorated with two Squadrons badges. Loss of the first Tiger (serial J-3013!) took place on 21-05-81 during an exercise involving 4 Northrop F-5E protecting 4 Hawker Hunter Mk.58 fighter-bombers, due to the collision with one of three Mirage IIIS intercepting the formation. The presence of three Squadrons equipped with very aged de Havilland Venoms dictated the urgent necessity to purchase additional Northrop fighters. A request for a second batch of 36 Northrop F-5E and 6 Northrop F-5F at a cost of sFr 770 millions for two Squadrons was approved by the parliament on 04-03-81. The price included munition, spare parts, support equipment and training support. An offset programm for Swiss products for the value of around sFr 300m was foreseen. Only the first single-seater was to be built at Palmdale, all the remaining aircrafts were to be assembled at the Swiss Federal Factory in Emmen; their flaps, elevators, ailerons and rudders, for a value of sFr 65m, were to be manufactured in Switzerland. The Palmdale built aircraft touched Swiss soil in Emmen AB on 17-02-83, coming from Prestwick (UK). An average of two airframes per month were subsequently assembled at Emmen. Modifications to the first batch included a "shark" nose, automatic slats and flaps plus a larger leading edge to improve stall and handling characteristics, particularly useful in the mountains. gramme taken care by F+W Emmen. visible on this four-ship formation. training missiles on the wingtips. 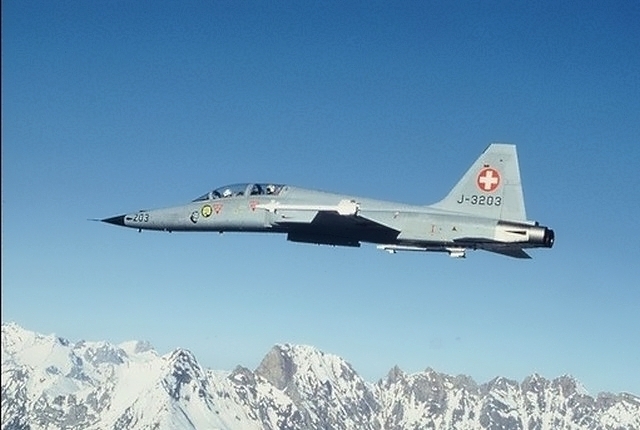 Swiss Tiger programm came to an end on 27-03-85, when the last single-seater was handed-over to the Air Force. Fly-away price of an single-seater of the second batch was sFr 13m, of a double-seater sFr 15m. Compensation programms were completed by mid 1987: total value for the first batch reached USD 209m between 1975 and 1981, total value for the second batch USD 272m by 1987. One two-seater (serial J-3209) was leased to Emerson Electric to show off a new radar, the APG-69, at the Le Bourget airshow in June 1985. This radar was not adopted by Switzerland. During the same month a contract was awarded to Northrop for full scale development and production of the AN/ALQ-171(V) ECM system. Unfortunately this did not come up to expectaction and was abandoned at the end of 1989. It was replaced in January 1993 by an order for Ericsson Erijammer Vista 5A/100 to equip four Northrop F-5E plus Pilatus PC-9s for training purposes only; delivery started in 1994. 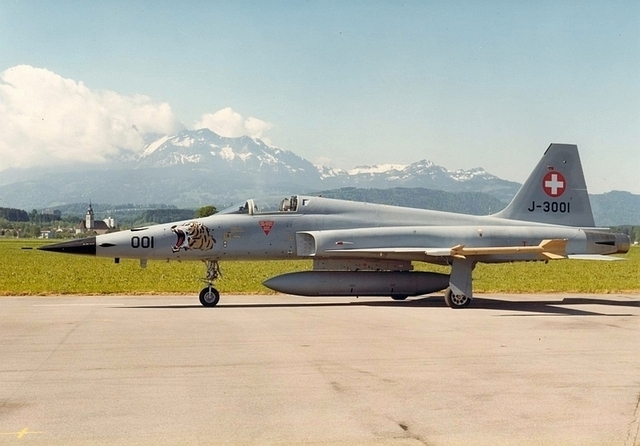 Another specific Swiss Tiger modification was the adaptation of four Northrop F-5E to tow for air-to-air shooting the Saab MBV-2S dart target (formerly used by Hawker Hunter Mk.58); first test flight took place on 06-02-97, trials were completed by March 1997. 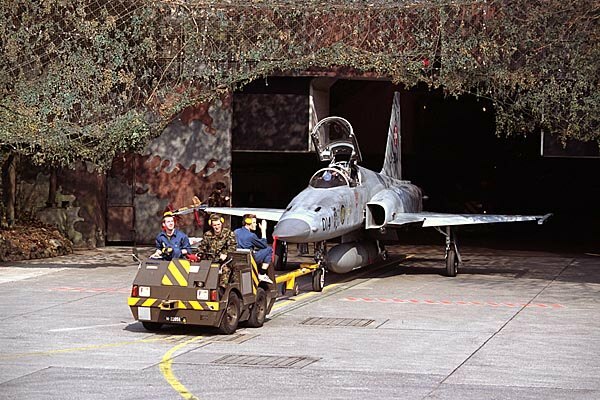 Aircrafts are stored at mountain bases in caverns, hereunder Nothrop F5E J-3041 being towed out of a well camouflaged one at Buochs AB on 29-04-03. A civilian organisation, the Federal Office for Military Airports (Bundesamt für Militärflugplätze, from 01-01-96 Bundesamt für Betriebe der Luftwaffe) has been responsible for first and second level maintenance of the Tigers, in addition to Air Bases operations during peace-time. Maintenance is taken care during emergency time by an Aviation Company (Fliegerkompanie/Companie Aviation) at each base. Modification of the nose cone was started in 1982 by the Emmen factory: a grey, flat cone was inserted and the VHF antenna. First important check regarding the whole fleet was in 1997, due to lose a bolt discovered on one aircraft; the discovery of fatigue cracks in the wings and again of a defectuos bolt in 1997 brought a serious crise: half of the fleet had to be grounded for some time. General reduction of military expenses came with the end of Cold War, together with a wide ranging restructuration programm, beginning during 1995, completed in 2005. The Tiger fleet was scaled down from 101 to 85 active aircrafts in 1998, 16 were put in storage, while the last night flights were stopped during the same year. The last airframe overhauled at Interlaken AB left the base on 22-12-99, shortly before this base was closed to jet operations on 31-12-99. This aircraft received a special undernose painting to commemorate the two events. McDonnel F/A-18s re-equipped in 1998 and 1999 two Northrop F-5E Squadrons while a second reduction round started on 31-12-03 with the disbandment of two Squadrons and the withdrawal of another 31 aircrafts (54 remaining in use). 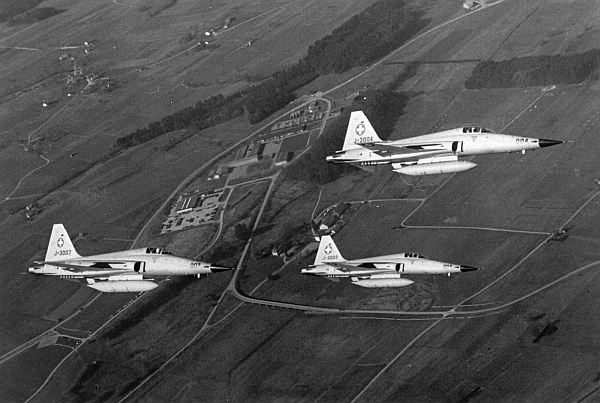 All forty-six redundant Northrop F-5E were put up for sale (an aircraft had been damaged and withdrawn from use earlier). Four permanent Tiger basis (Dübendorf, Payerne, Meiringen, Sion) were kept operational; some were closed (Mollis, Turtmann, Interlaken), placed on a "sleeping" status (Buochs) or operationally used by Air Force helicopters only (Emmen, Alpnach). Line-up at Meiringen AB in a typical Swiss alpine background. A last upgrade in communication technology took place in 2000: Have Quick I radios were installed in the aircrafts to make them compatible with McConnell F-18s. Twelve Northrop F-5F were kept for general services, electronic warfare and advanced pilot training - a new duty following retirement of the Swiss BAe Hawk on 13-12-04.
to remember the closure of this base on 31-03-03. Jet aircrafts operation out of Dübendorf AB (the first ever Swiss base) ended on 31-12-05, reducing operational bases to three. Five single- and four double-seaters based there had already been distributed among other bases on 15-12-04. The year 2009 saw the grounding of four double-seaters when they approached the need for major servicing: Pilatus PC-21 took over the advanced jet pilot training in mid 2008; four were to be flown only up to moment they needed main checks and maintained flying able with a minimum of servicing. The remaining four active ones were to be kept for Target Towing and Electronic Warfare and militia pilots training. The Tiger fleet reached the goal of 250'000 flight hours in January 2010. RUAG Aviation and Space (former Eidgenössischen Flugzeugwerk and S+F Aerospace) was formed on 01-01-99, in the wawe of the restructurating as a holding company comprising the aircraft factory at Emmen plus additional aviation related factories responsible for manufacturing, maintenance, repair and overhaul of aircrafts and instruments. 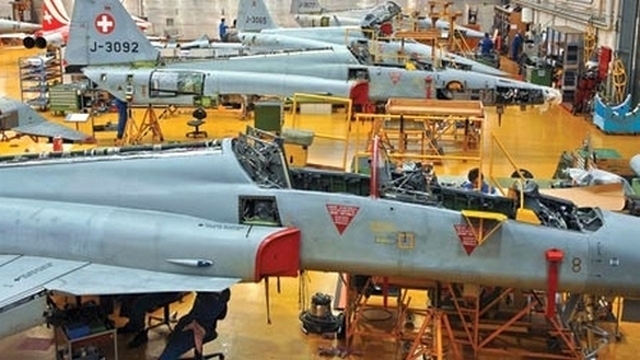 The factory is still in charge to repair and maintain the Swiss F-5 fleet; it has signed a roaming agreement with Northrop Grumman to provide additionally worldwide support, modification and upgrade programms to countries still flying the aircraft. Brazil signed a Memorandum of Interest on 15-10-02 for 16 Northrop F-5E, 8 to be modified as double-seaters; it modified later its request wishing original Swiss double-seaters; this request was rejected as these were not up for sale. 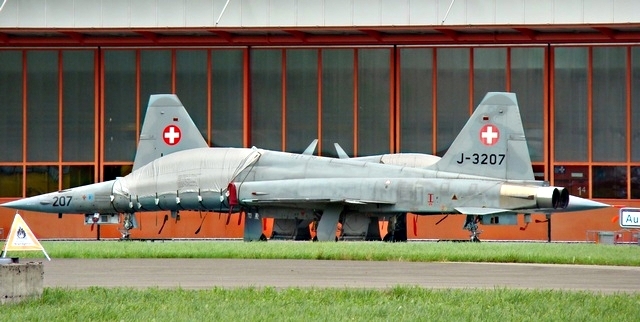 A Swiss offer, in 2003, to transfer 2 F-5F and 14 single-seaters was not accepted. More luck had the sale of an initial lot of 32 single-seaters from the first batch to the US Navy for a price of sFr 25m; a contract was signed on 07-03-03. These were aircrafts in need of a general overhaul having flown between 1'800 and 2'400 hours. They were to be modified according to US Navy wishes and restored to flying capability by Grumman Northrop before being transferred to US Navy and US Marines aggressor units. The sale was endangered for some time by the restrictions to arms exports imposed by the Swiss government following US invasion of Iraq on 30-03-03; but these were cancelled in mid-April. The first aircraft left Emmen on board of an US Navy Lockheed C-130T on 02-05-03. Only five were delivered in 2003 due to US Navy budgetary problems, seven followed in 2004. Sixty General Electric J-85 engines were overhauled at Emmen by RUAG, while an additional 18 were sold as reserves. Loading the first US Navy aircraft, serial J-3026, at Emmen on 02-05-03. A total of 12 additional single-seaters was later optioned in small batches, bringing total costs to USD 50m; the options were all taken up. Twenty five aircrafts had been delivered to the US Navy by April 2006; the very last Tiger (serial J-3025) left Emmen on 13-11-07, being airfreighted to Northrop-Grumman's facility at St. Augustine, Florida, on a US Navy C-130T. Interestingly, three former Swiss aircrafts were modified to double-seater by Grumman Northrop. 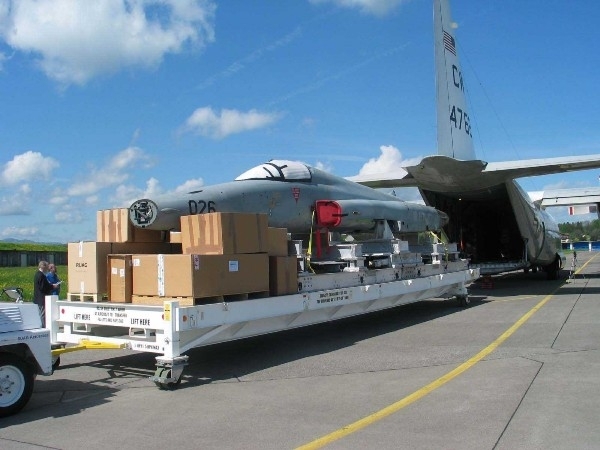 Not a sale but a lease was arranged with Austria in mid-February 2004; 12 Northrop F-5E were leased for four years, with an option for extension of a maximum of two years. The contract was signed at the end of April 2004 with the Swiss armament Agency "Armasuisse" to the approximate cost of Euro 14m per year. This included logistics for the Austrian main and reserve base (Graz-Thalerhof and Linz-Hörsching), documentation, armament, training of flight and maintenance crews as well as maintenance of the aircraft by RUAG at Emmen. The first four aircrafts (serials J-3005/30/33/65) were trasferred from Emmen to Graz-Thalerhof on 07-07-04, officially accepted on 09-07-04; the last (serial J-3014) followed on 14-12-05. All former Austrian Tigers were returned, starting on 30-06-08, ending on 24-07-08; ten are confirmed to have been returned to Swiss service. Some of the withdrawn aircrafts, particularly Northrop F-5F, are still up for sale, while at least one F-5E is on display at the Dübendorf Air Force museum. August 9th 2011. In the back-ground an F-5E, also withdrawn from use. 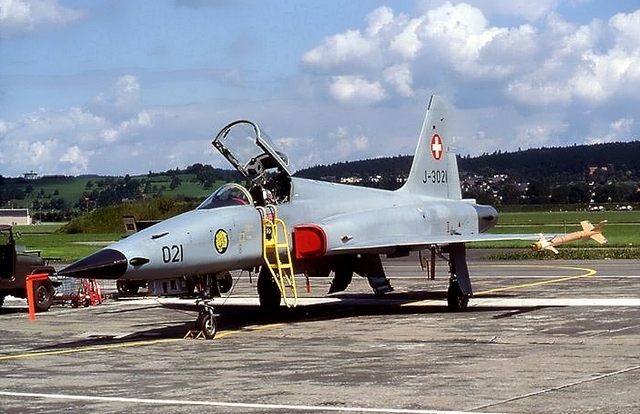 Northrop F-20 82-0062/N4416T was demonstrated unofficially to the Swiss military authorities at Emmen AB on 26-09-83 as a possible successor to the Tiger but did not arouse local interest. Initial thoughts for a replacement fighter were made at the beginning of the 2000's; an offer by Israel's IAI to modernise the remaining Tigers in order to keep them operational till 2020 at a rather low cost was not accepted. Instead, fourth generation fighters were taken into consideration, starting a very controversial selection exercise/saga. Offer were requested for Saab JA-39 Gripen, Boeing F-18E/F, Dassault Rafale, Eurofighter Typhoon; these (with the exeption of the Boeing F-18E/F) were tested in depth in Switzerland in 2008 but lack of finance postponed several times the definitive selection till 2012, meaning that the good, old Tiger remained in use (this without any in-depth upgrade!). At present Northrop F-5Es are used as "aggressors" against McDonnell F/A-18s and as targets for the Swiss Army anti-aircraft units as well as for relieving the more modern fighters from general air policing duty during daytime. pilot school class in 2008. Surprisingly, a request to check feasibility to extend the life of Tigers (approximately 30) for 15 to 20 years (up to 2031!) was issued by the Swiss Defence ministry on 20-04-11, just in case the purchase of a new fighter would be delayed. On 30-11-11 the Swiss government announced it had decided to purchase 22 Saab J-39 Gripen as the Tiger successor, though this selection was highly contested. Approval by the Swiss parliament for the purchase was given in automn 2013 but a referendum was set for 18-05-14 for the definitive approval of fundings by Swiss people. Funds for the purchase of the Saab Gripen were denied and by mid-June 2014 a new appraisal to keep the Tigers left in service for approximately another 10 years (with modifications) was requested by the Swiss parliament. This was informed on 29-08-14 that the costs for upgrading Northrop F-5s would vary between 900m SFr (day only, minimal instrumental/night operations) and 1.2 billions (for full air defence equipment day/night operations), both costs being considered too expensive. The Tigers should be retired between 2016 and 2018 and put on sale. Unofficial sources report in 2014 that 18 aircrafts were to be sold to the USA, the contract to be finalised by the end of 2014; other non-Swiss sources mentioned that a contract was signed by Uruguay in October 2014 for the acquisition of 8 single-seaters and 2 double-seaters to replace their Cessna A-37B; these were to be delivered between late 2016 and 2018 in several batches. The airframes would be donated by Switzerland and be put under a major overhaul/modernisation by the Swiss company RUAG for USD 20m. Both sales were officially denied. A crack on an aircraft's supporting structure was found during a major overhaul in 2014, followed by another aircraft in January 2015; the Air Force ordered subsequently an inspection on the entire fleet, cpmpleted in April 2014. On 20-04-15 it was officially mentioned that thirty two (out of 54) Tigers were serviceable plus 16 where cracking haD been discovered; 6 would be repaired and returned to service while 10 would be withdrawn for use. In use in August 2015 were 11 Patrouille Suisse acrobatic team, 11 grey Tigers and 4 double-seaters. Another source metioned in January 2015 that only 36 aircrafts are operational, additional 18 are needed deep maintenance (not to be done). Only 22 single- and 4 double-seater were to be maintained in use. Two Northrop F-5E and 8 F-5F were to have in-depth maintenance in 2016 and 2017 but only the remaining hours would be flown, followed by a reduced maintenance to keep them operational for emergency situations only. They will not be in normal Squadron use. Six withdrawn from use Northrop F-5E and F-5F were parked in April 2015 in the open air at Emmen due to missing space availability in the hangars since months. The minister of defence proposed that the Air Force to hire a number of Gripen C and D in 2016 but this was not realised. According to statements in September 2015 a new evaluation for 22 fighters had to take place; the Eurofighter was withdawn from the competition and the Gripen, Rafale and F-18 werw still on the list of a possible purchase, to be selected within 2020. The present three Northrop F-5Es units will be disbanded by the end of 2017, two reforming to operate the remaining 22 single- and 4 doubleseaters used to retain pilot procufency, as ECM aircrafts and as adersary for McDonnell F/A-18s, foreseen till at least 2015. Budgetary problems are given for the acquisition of 20 mm cannons, the fate of the Sidewinders AIMP-9J Sidewinder and that of 15 F-5s and 9 F-5Fs retired (mainly stored at Emmen) has still to be decided. Some Hornets pilots will retrained on the Northrop aircraft.